Editor's Note: This blog post first appeared in August 2011, at the end of blogger Jennifer Baulier's summer internship. We are republishing her blog post now that JMP 10 has been released and the Micromaps add-in discussed in the post is now available in the JMP File Exchange. JMP 10 is the minimum version required to create Micromaps using this add-in. Download of the add-in requires a free SAS profile. My name is Jennifer Baulier, and I am a summer student at JMP. I attend college at WPI (Worcester Polytechnic Institute), and applied for my internship at SAS through the R3 program. I am going into my sophomore year and am studying both computer science and video game development. I have really loved my time here and have learned a lot especially while working on my Micromap project, which is explained below. In June, Xan Gregg blogged about a Micromaps presentation by Dan Carr. 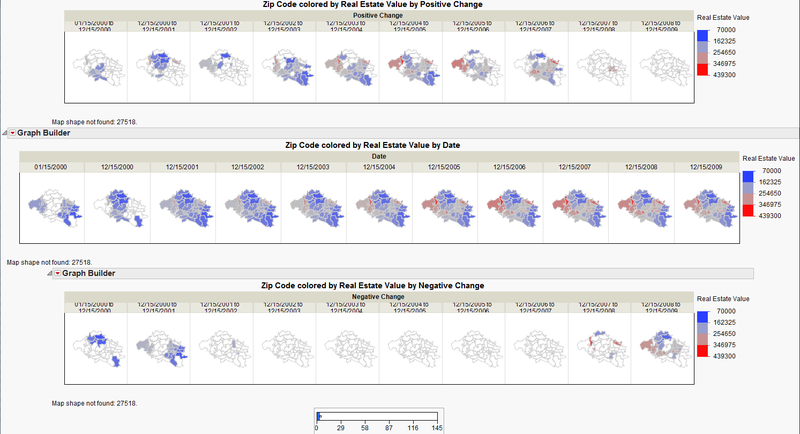 At the time, Graph Builder could approximate Conditional Micromaps minus a few key features. My project adds on to what Graph Builder was already doing in order to recreate several types of Micromaps (Comparative, Conditional, and Conditional with Percent Difference). All of the red ACT scores occurred in southeastern states. 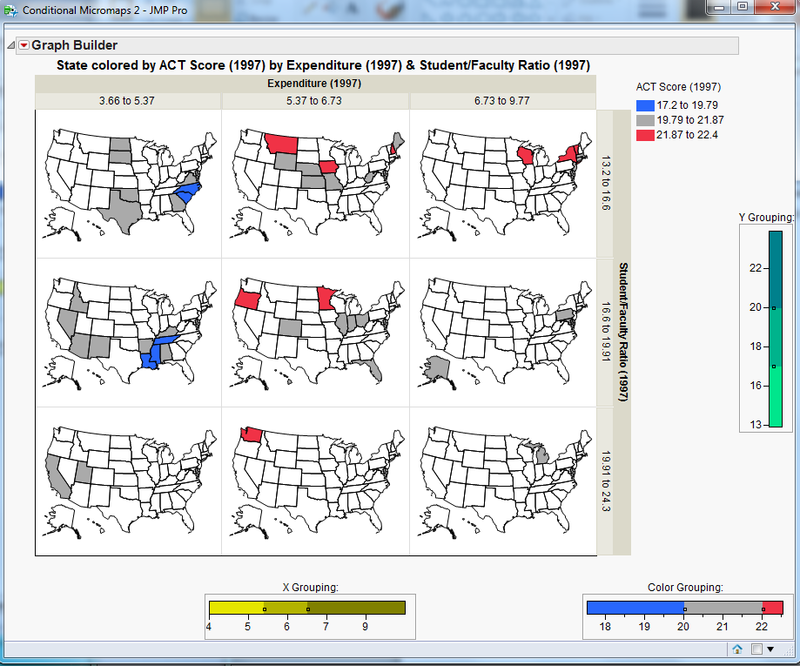 All red ACT score occurred in state with at least mid-range expenditures. 2007 to 2009 showed a huge increase in unemployment. 2010 to 2011 showed improvement. Most states that hit the red zone were in the South. Three consecutive central states stayed blue the entire time. The first two boxes on the decrease panel reflect the dot-com crash in 2000-2001. The next six boxes show the economic boom that followed. Chapel Hill, North Carolina, (the area on the far left) goes from light blue all the way up to bright red, showing how extreme the economic boom was for some areas. The last two boxes in the decrease panel signify the current economic downturn. Both types of maps are useful, but there are certain situations where using one opposed to the other would make a significant difference. When you have thresholds you need to observe. When you want to give a simplified report that is easy to view. When you need to filter out a given amount of variation. When you have a few outliers making setting ranges impractical. When you want to find the most drastic changes. When you intend on showing the duration of a period of increase or decrease. Micromaps are a clear and concise way to view both regional trends and correlations in data. Furthermore, the interactive nature of the maps makes it easy to adjust the report in order to find helpful information. Comparative and Percent Difference Micromaps focus on deltas while Conditional Micromaps focus on correlations. The slider bars in this project are not a standard display box item and were my design. You may see two-prong as a display box item in future versions of JMP as a result of this project.